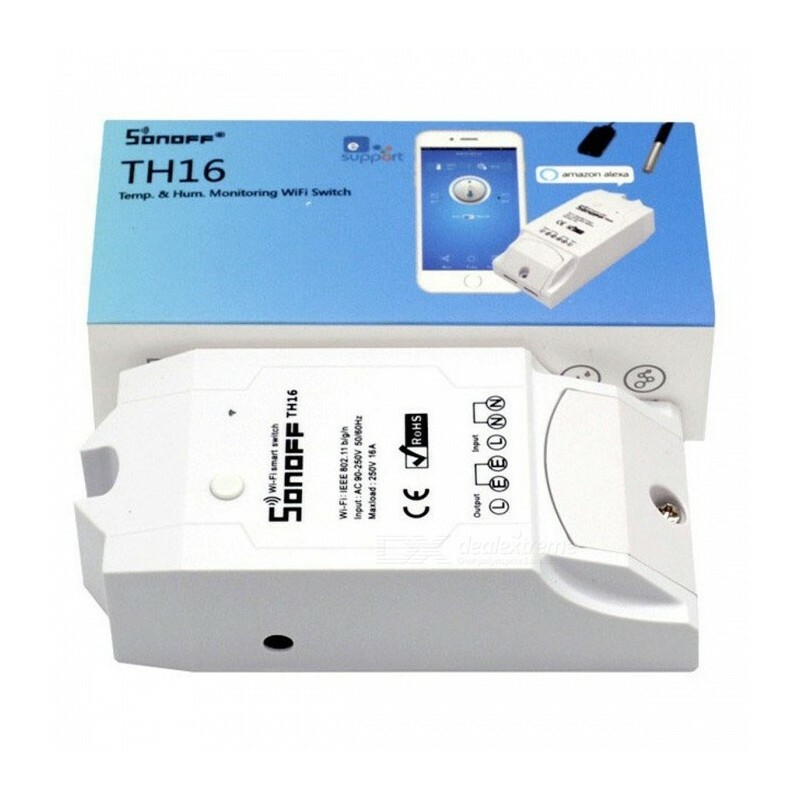 Šios relės pagalba, ne tik galėsite valdyti įrenginius per WiFi mobiliuoju telefonu ar kompiuteriu, tačiau taip pat galėsite stebėti kambario temperatūrą ir drėgmę, sudaryti tvarkaraščius nuo kokios temperatūros ar drėgmės įjungti rėlę, o ties kokia išjungti. 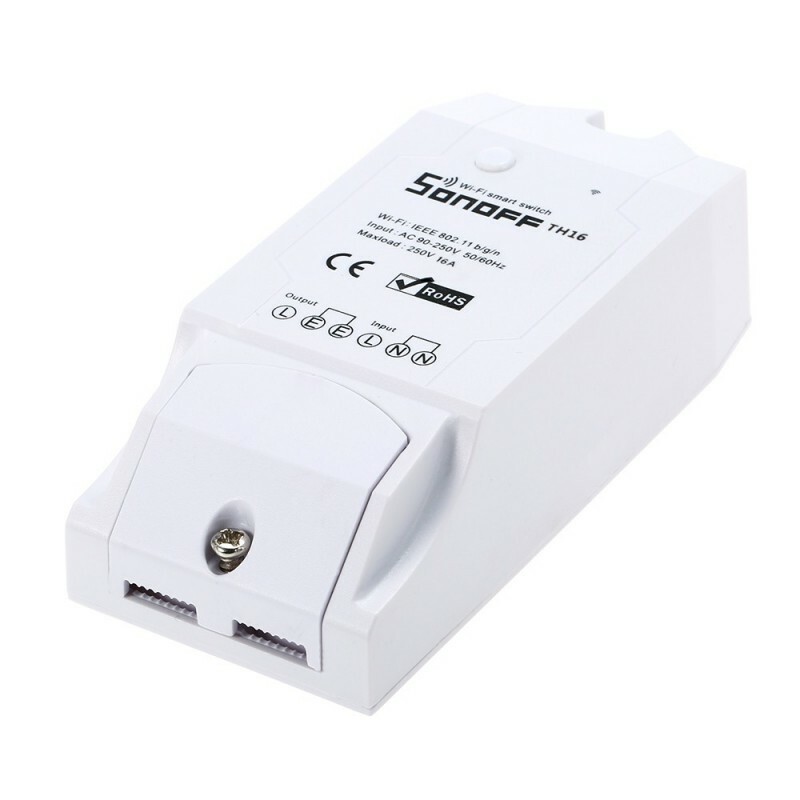 Prie įrenginio gali būti jungiami AM2301 / DS18B20 jutikliai. 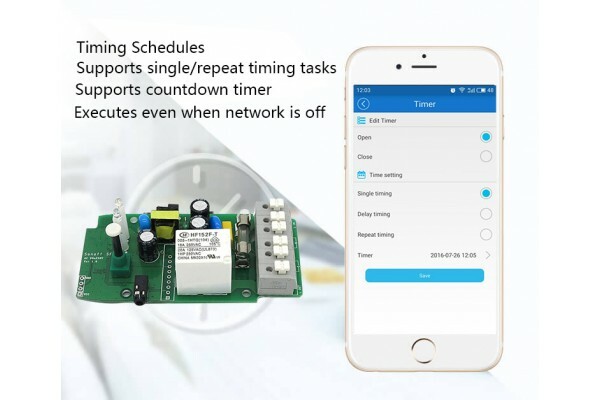 Šiam įrenginiui nereikalinga jokia papildoma techninė ar programinė įranga. Vardinė srovė: 16A. 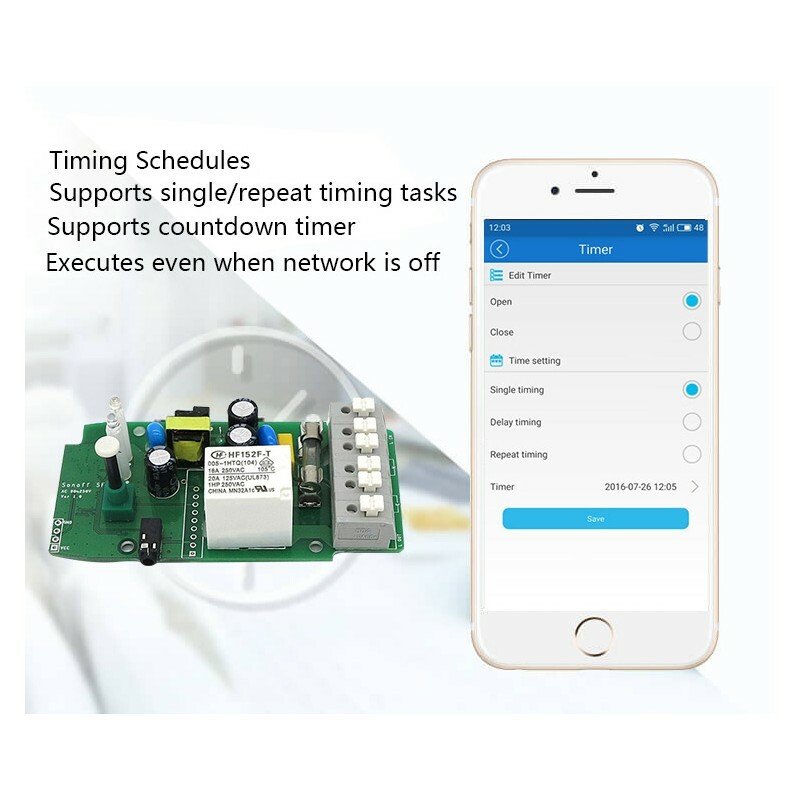 Sonoff TH16 is a wireless temperature and humidity monitoring switch which can remote monitor and set temperature and humidity range to turn on/off connected appliances through the iOS/Android APP eWeLink. 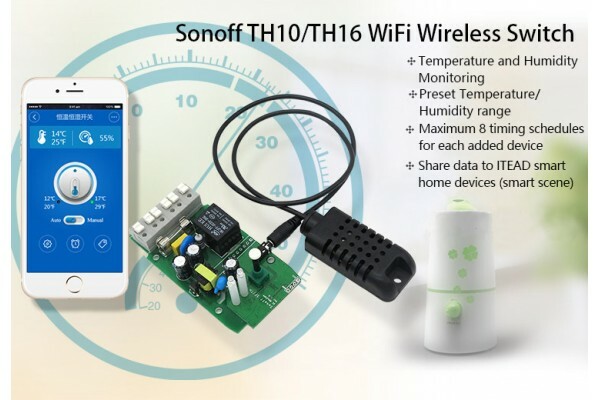 Just as the name indicates, the Sonoff TH temperature and humidity monitor device supports two maximum current supply specifications: 16A. 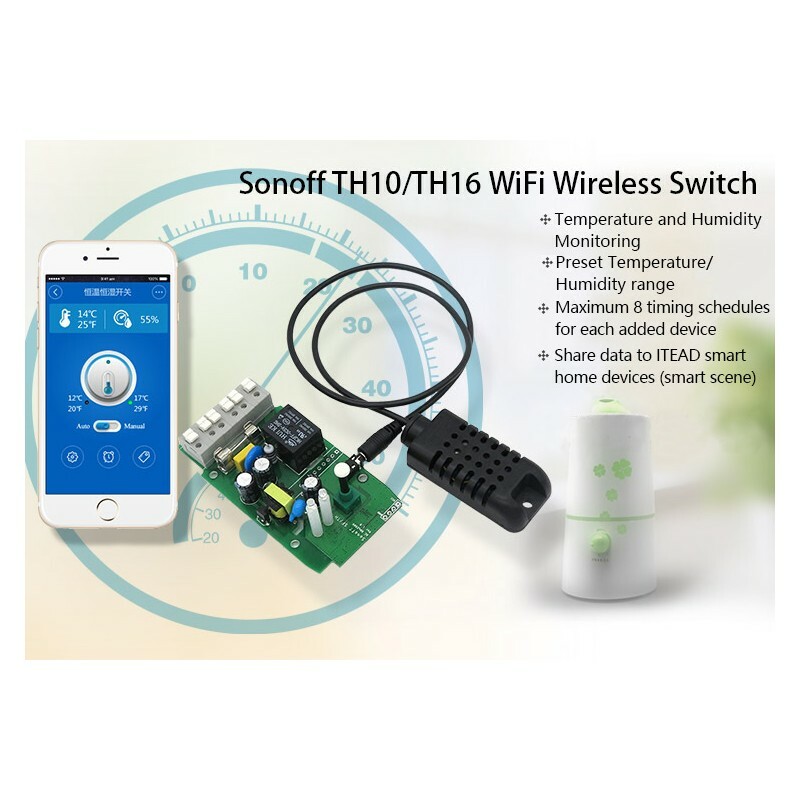 Sonoff TH16 remote temperature monitor and wireless humidity monitor WiFi switch supports presetting the range for temperature or humidity. 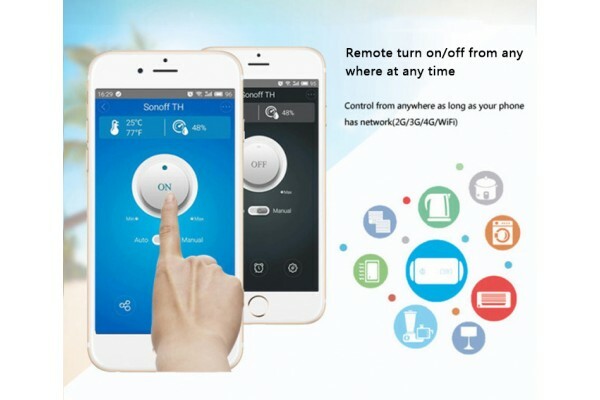 When the temperature or humidity of the environment falls within the range, it will automatically turn on or off the connected devices. 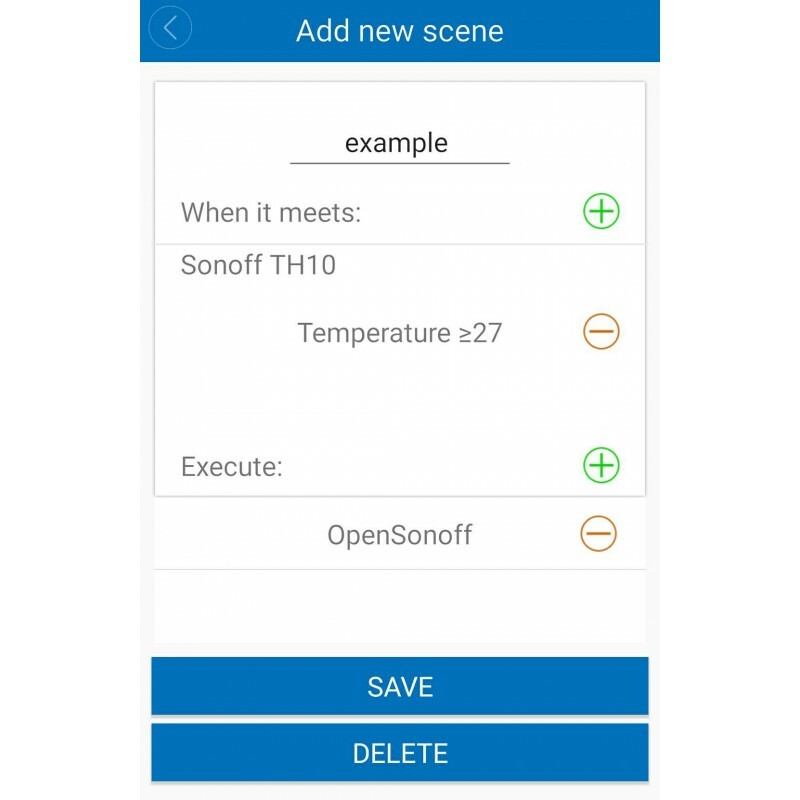 With the latest eWeLink app, users can create a series of simple conditional statement (Smart Scene) to trigger on/off other smart devices. 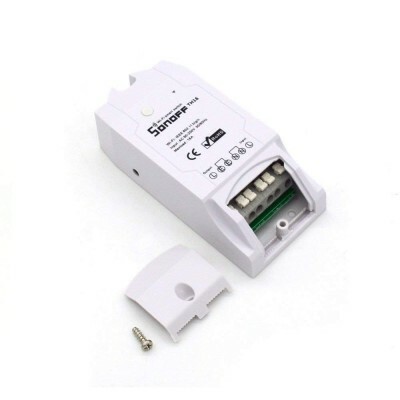 This means users can use Sonoff TH10 with AM2301, DS18B20 or DHT11 sensor to collect temperature/humidity data, which can be used to as a condition to trigger on/off other devices, such as Sonoff, Sonoff RF, Sonoff SV, S20 smart socket (see below pic). 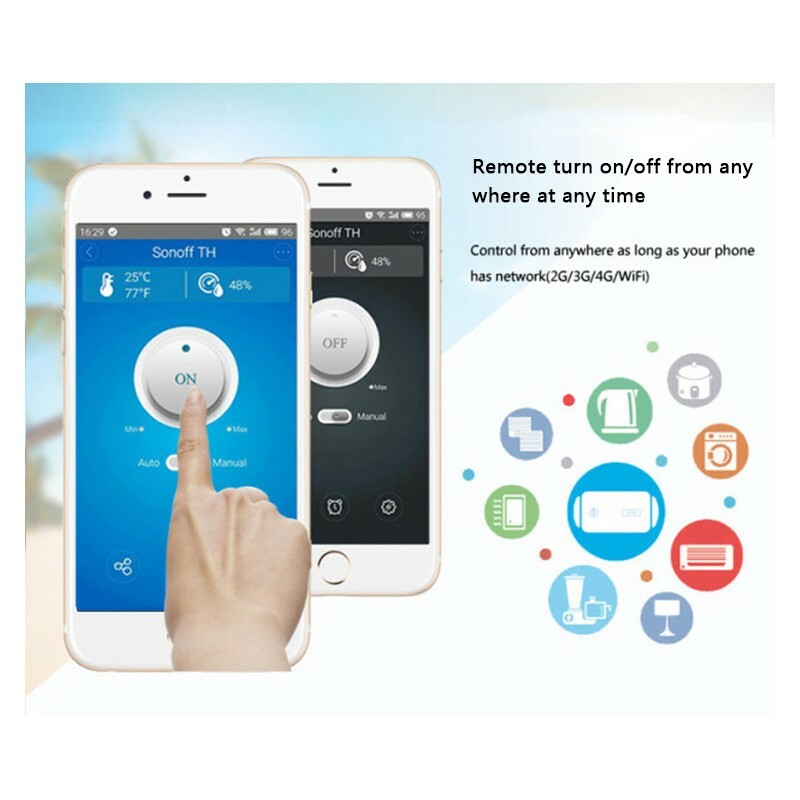 This device works perfectly with electric fan, air conditioner, humidifier, smart fish tank, watering system, etc. 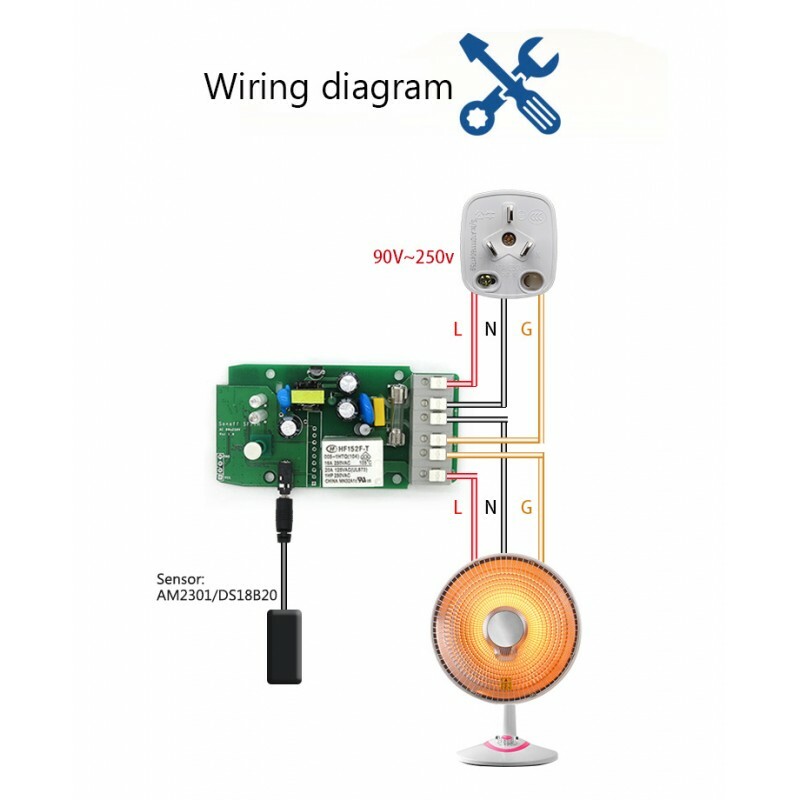 We are selling two kinds of sensors: AM2301 and DS18B20(measures temperature only). 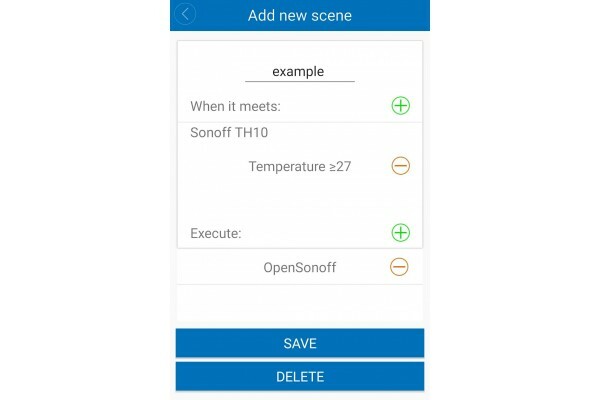 We've customized an interface for Sonoff TH10 to easily connect with the sensor-just plug and play. 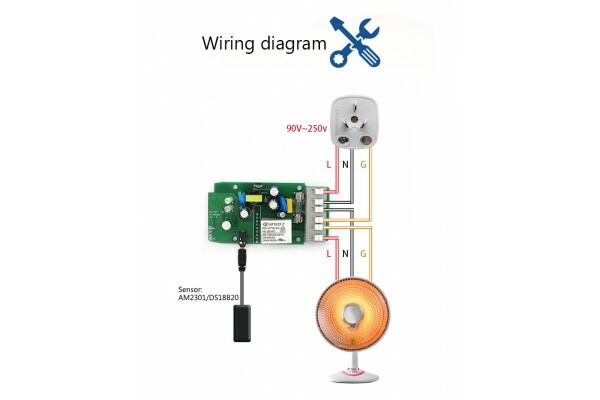 Note that the sensor should be plugged before power up. It is not advised to plug or unplug the sensor in power on state. 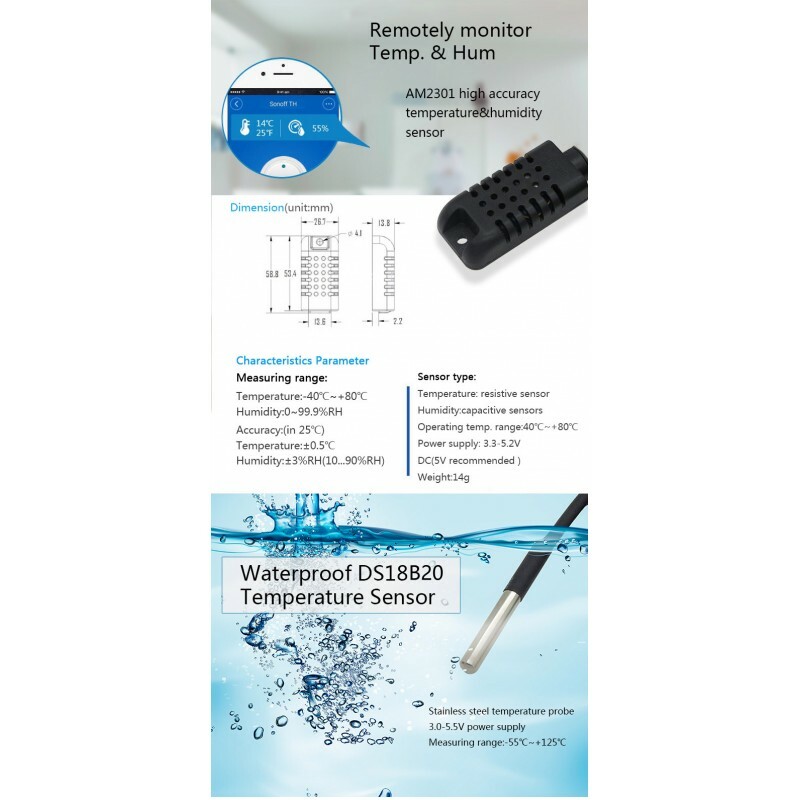 Furthermore, AM2301 is non-waterproof, while DS18B20 is waterproof.